Today is shaping up to be unofficial "Unify your App UI Day" apparently. We just saw Skype push an update for Android phones that brings the app's UI in line with the Windows 8/Windows Phone 8 versions of the app, and now we're seeing the same happen with the OneNote app for Android and iOS, which have both been updated to give OneNote a unified UI. The design has been updated on Android devices as well as iPhone and iPad so your notes will look the same on all devices, right down to the ink rendering on handwritten notes. The updates also add a number of new formatting options so text formatting, tables with shading and borders, layout, etc are all the same on the different platforms. There are new options for creating voice notes as well as homescreen widgets specifically for Android users, and as far as updates for everyone, the other improvements are in sharing. Support has been added for syncing notes to Office 365 and SharePoint, and Microsoft says that sharing with SkyDrive should be "more reliable" now as well. But, maybe the best part of the update is that OneNote has removed the limit for notes created with the free version, so now you can create as many notes as you want on the free version. 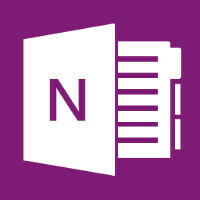 So, if you want to try it out, you can grab the new OneNote for iPhone, iPad, or Android. FINALLY! I stopped using OneNote when I upgraded to the iPhone 5. Now if we can just get Samsung on board with their blu ray remote app to support the iPhone 5 display... Lol, like that would ever happen.